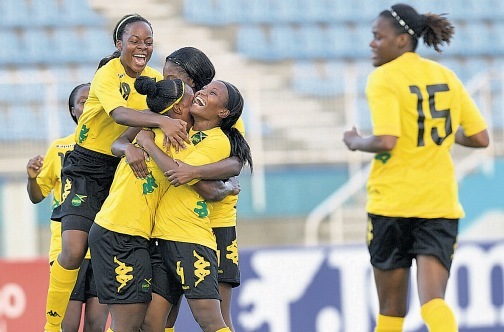 Jamaica’s senior team trounced Martinique 6-0 in today’s opening Group B CONCACAF Women’s Championship match at the Sporting Park in Kansas with two goals each from Christina Murray and Donna-Kay Henry. Murray, the attacking midfield player, struck in the second and 74th minutes. The wide-attacker Henry got her double after strikes in the 22nd and 76th minutes. Striker Shakira Duncan, in the 6th minute, and a goal from substitute forward Alexa Allen in the 71st completed the rout. The Reggae Girlz will play against Costa Rica in Illinois on Saturday before completing the preliminary round against Mexico in Washington, DC, next Tuesday. The top two teams in each of the two groups will advance to the semi-final stage. A win for Jamaica against Costa Rica could secure a place in the semis. The best three teams at the championship will automatically qualify for the 2015 FIFA Women’s World Cup in Canada. The fourth-placed country from CONCACAF will enter a World Cup spot play-off against Ecuador, South America’s third-placed team.